We investigated the independent association between several neighbourhoodbuilt environment features and physical inactivity within a national sampleof Canadian youth, and estimated the proportion of inactivity within thepopulation that was attributable to these built environment features. This was a cross-sectional study of 6626 youth aged 11–15 yearsfrom 272 schools across Canada. Participants resided within 1 km oftheir school. Walkability, outdoor play areas (parks, wooded areas, yards athome, cul-de-sacs on roads), recreation facilities, and aesthetics weremeasured objectively within each school neighbourhood using geographicinformation systems. Physical inactivity (<5 days/week of60 minutes of moderate-to-vigorous physical activity) was assessed byquestionnaire. Multilevel logistic regression analyses, which controlled forseveral covariates, examined relationships between built environmentfeatures and physical inactivity. The final regression model indicated that, by comparison to youth living inthe least walkable neighbourhoods, the risks for physical inactivity were28-44% higher for youth living in neighbourhoods in the remaining threewalkability quartiles. By comparison to youth living in neighbourhoods withthe highest density of cul-de-sacs, risks for physical inactivity were28-32% higher for youth living in neighbourhoods in the lowest twoquartiles. By comparison to youth living in neighbourhoods with the leastamount of park space, risks for physical inactivity were 28-37% higher foryouth living in the neighbourhoods with a moderate to high (quartiles 2 and3) park space. Population attributable risk estimates suggested that 23% ofphysical inactivity within the population was attributable to living inwalkable neighbourhoods, 16% was attributable to living in neighbourhoodswith a low density of cul-de-sacs, and 15% was attributable to living inneighbourhoods with a moderate to high amount of park space. Of the neighbourhood built environment exposure variables measured in thisstudy, the three that were the most highly associated with inactivity werewalkability, the density of cul-de-sacs, and park space. The associationbetween some of these features and youths’ activity levels were in theopposite direction to what has previously been reported in adults andyounger children. Over 90% of American and Canadian youth do not meet the public health guideline of60 minutes of daily moderate-to-vigorous physical activity [1, 2]. This is a problem as youths’ physical activity levels track overtime [2, 3] and because inactivity is related to obesity, cardiovascular andmetabolic disease risk factors, bone density, and mental health outcomes . In order to develop effective public health policies and interventionsaimed at increasing the physical activity levels of young people, the keydeterminants of this behaviour need to be understood . While characteristics of young people (e.g., age, gender) and theirfamilies (e.g., parental role modeling, socioeconomic status) are importantdeterminants [6, 7], so too are aspects of the neighbourhood environments in which they live [8, 9]. Several features of the neighbourhood built environment are potentially relevant forphysical activity. Features that facilitate walking and bicycling, such aswell-connected street networks , mixed land use [11, 12], low speed limits on roads , and the presence of sidewalks along roads  may contribute to increased active transportation but may have adverseeffects on active play. Active play within young people can also be influenced bythe availability of outdoor play spaces such as parks and other public green spacesand wooded areas [14–16], yards at home [17, 18], and cul-de-sacs on roads [18, 19]. Recreation facilities where youth can engage in organized sports mayalso be important determinants of physical activity levels, including communitycentres [20–22], arenas , pools [23, 24], and courts/tracks . Finally, aesthetic features may influence whether people want to beoutdoors and engage in physical activity in their neighbourhood [25, 26]. As existing studies have not simultaneously considered the impact of allof these built environment features, it is difficult to determine which features arethe most strongly related to the physical activity levels of young people. It is important to determine the relative importance of each built environmentfeature. This information can help direct priorities as it is not feasible tosimultaneously address and improve all built environment features. From a publichealth perspective, the relative importance of the different built environmentfeatures can be determined by comparing their population attributable risks (PAR%).The PAR% is an estimate of the proportion of an outcome within the population, suchas physical inactivity, that is attributable to a risk factor, such as living in aneighbourhood with a poor built environment feature. It is a function of theprevalence of the population exposed to the built environment feature and the impactthat exposure to that feature has on physical inactivity . To our knowledge, existing studies have not estimated the PAR% forphysical inactivity attributable to different features of the neighbourhood builtenvironment. The objectives of this study were: (1) to determine the independent associationsbetween different neighbourhood built environment features and physical inactivitywithin youth, and (2) to estimate the proportion of physical inactivity within theyouth population that is attributable to these same built environment features.These objectives were addressed using a national study of Canadian youth in grades6–10. The relationship between neighbourhood built environment features and physicalinactivity was examined within the 2009/10 Canadian Health Behaviour inSchool-Aged Children Survey (HBSC). The HBSC is made up of two components: (1) ageneral health survey conducted on a representative sample of 26,078 Canadianyouth in grades 6–10 from 436 schools across the country, and (2) GISmeasures of the built environment in the neighbourhoods surrounding theparticipating schools. The 2009/10 HBSC is a cross-national survey conducted in affiliation with theWorld Health Organization. This study was limited to the Canadian sample. TheHBSC survey covered several aspects of health, health behaviours, and physicaland social determinants of health. The Canadian sample was designed according tothe international HBSC protocol . The strategy followed a systematic multi-stage cluster technique,whereby individual students are nested in school classes that are nested withinschools and school boards. The 2009/10 Canadian HBSC included 26,078 studentswith distributions reflecting the distribution of Canadians in grades 6–10(approximate age range 11–15 years) from 436 schools. All provincesand territories in Canada participated with the exception of Prince EdwardIsland and New Brunswick. Students enrolled in private, special needs, or homeschools, as well as incarcerated youth, were excluded; combined they contributeto <10% of the Canadian youth population. Consent was obtained and providedby school boards, individual schools, participants, and their parents/guardians.Ethics approval was obtained from the General Research Ethics Board ofQueen’s University. In this study we used a 1 km radius circular buffer around schools as aproxy for the home neighbourhood. It was not feasible to measure all of thebuilt environment constructs using each student’s home as the centre pointof the environment. We therefore attempted to limit the sample of 26,078students to those students who lived within the 1 km circular buffer oftheir school. A 1 km distance represents a 10–15 minute walkingtime and is an appropriate distance for this age group (ie, younger youth do nottypically travel >1 km from home unsupervised) . Since many students from the full sample do not live within a1 km distance of their schools, they were excluded from the analyses. Basedon the centre of the geographic area covered by each student’s postal code(which within Canadian cities are quite small and typically cover one or twoblocks), we calculated the straight line distance between their house andschool. Those students living more than 1 km from their school wereexcluded. Alternatively, for the 40% of participants who did not indicate theirpostal code on the survey, distance to school was estimated based upon theirreported mode and travel time to school from two survey questions. Students withexcessive travel time (i.e., > 15 minutes by walking or>5 minutes by bicycle or motorized transportation) were assumed to livemore than 1 km from their school and were therefore excluded(n = 8,917 students). Third, students with missing information onthe physical activity outcome (n = 8.669) and/or potentialcovariates were excluded (n = 8,032). Lastly, schools where allbuilt environment features could not be measured were excluded(n = 6,626). The final sample consisted of 6,626 students from 272schools. Information on physical activity behaviours was collected from the average ofstudents’ responses to two questions: “Over a typical or usualweek, on how many days are you physically active for a total of at least60 minutes per day?” and “Over the past7 days, on how many days were you physically active for a total of atleast 60 minutes per day?” Reliability estimates demonstratea good level of agreement between the two survey questions (Cronbach’salpha = 0.79), and the mean of the two items performed better inreliability and validity analyses than either item separately . Validation studies demonstrate a good test-retest reliability forthese two questions (67 to 85% agreement; intra-class correlation value of 0.71)and the questionnaire responses are correlated with objective measures ofphysical activity obtained by accelerometry (r = 0.39) [31, 32]. Participants were placed into one of two groups based on theiraverage response to the two questions: physically inactive (≤4 daysper week) vs. physically active (> 4 days per week). Although thephysical activity guidelines in Canada recommend 60 minutes ofmoderate-to-vigorous physical activity daily , the cut-point of ≤4 days per week was chosen as itcorresponded to the lowest ~25% of the sample and simplified interpretation ofthe data. The addresses of the 272 schools were mapped in ArcGIS and a 1 km circularradius buffer was constructed around every school. Several built environmentfeatures were measured within these 1 km buffers. Features were selectedbased on their established associations with physical inactivity and/or obesityin young people and their availability to the research team through national GISdata [8, 33]. As explained in more detail below, we grouped together builtenvironment features that measured a similar construct to investigate thefollowing environmental influences: walkability, outdoor play areas, recreationfacilities, and aesthetics. Six walkability items were measured: intersection density , average block length , connected node ratio , mixed land use [11, 12], road speeds , and sidewalk coverage [34, 35]. Measures were obtained using ArcGIS software with CanMap®Streetfiles, CanMap® Route Logistics, and Google Earth Streetviewimaging. Intersection density is the number of intersections per unit ofarea , and was calculated by dividing the total number of real nodes bythe land area within the neighbourhood buffer. Connected node ratio refersto proportion of intersections within a buffer that are 3 or 4-wayintersections , and was determined by dividing true street intersections by thetotal number of intersections, including cul-de-sacs and dead ends. Averageblock length was calculated by dividing the total length of roads in eachbuffer by the number of true intersections . Land-use mix refers to the types of buildings that comprise anarea , and for this study consisted of the percentage of total landarea comprised of residential area [20, 26]. Road speed was measured as the percentage of the total roaddistance within the buffer that was comprised of low speed roads, definedhere as having a speed limit ≤50 km/h. Sidewalk coverage wasmeasured as the percentage of the total road distance within the buffer thatwas comprised of roads with a sidewalk on one or both sides . We created a summary walkability scale based upon the six items usingprincipal component analysis. Results revealed one factor that accounted for60% of the variance. The four variables that loaded onto this factor andtheir factor loadings were: land-use mix (0.84), road speeds (0.80),intersection density (0.75), and sidewalk coverage (0.71). TheAnderson-Rubin method was used to calculate a summary walkability z-scorefor the components that were derived from the principal components analyses.These summary scores were subsequently divided into quartiles. Four outdoor play space items were measured: parks and other public greenspaces [15, 16, 22], open wooded areas, the presence of cul-de-sacs on neighbourhoodroads [17–19, 37], and presence of yards at home [18, 37]. Measures were obtained using CanMap® Streetfiles, CanMap® Route Logistics, CanMap® Parks and Recreation, andGoogle Earth Streetview Imaging in ArcGIS. The proportion of total land areadevoted to parks and other public green spaces (including national parks,provincial parks, territorial parks, and municipal parks/sportsfields) wascalculated for each buffer [22, 38], and the neighbourhoods were divided into quartiles. The same wasdone for wooded areas, however, since 40% of students lived inneighbourhoods with no wooded areas, a ‘none’ category wascreated and tertiles were created for the remaining 60% of theneighbourhoods. Cul-de-sac density was measured by subtracting the number oftrue intersections from the total number of intersections in each schoolbuffer and dividing by the land area of the buffer . To measure the presence of yards at home, 15 observations pointswere plotted in each 1 km buffer in an evenly spaced grid(approximately 500 m apart in the X and Y directions from thebuffer’s centre). Within Google Earth Streetview, a 360 degreepanoramic view was taken at each of the 15 points to measure the proportionof houses and other buildings that had a yard in front using the followingscale: 0 = ‘none’,1 = ‘less than ¼’,2 = ‘¼ to ½’,3 = ‘more than half to ¾’ and4 = ‘more than ¾ to all’. Asummary yard score was created for each buffer by summing the scores fromall 15 points, so that each buffer had a score ranging from 0–60. Aprincipal component analysis investigating the outdoor play space measuresrevealed little agreement between them (Cronbach’salpha < .10). Each measure was therefore examined as anindividual exposure variable. The number of recreation facilities was measured within each buffer usingArcGIS software and the Enhanced Points of Interest database (DMTI SpatialInc., 2009). Standard Industrial Classification codes were identified andsummed within each buffer for the following facilities: dance studios andhalls, bowling centers, physical fitness facilities, public golf courses,membership sports and recreation clubs, and amusement and recreation notelsewhere classified. The total number of recreation facilities within eachbuffer was summed and divided by the buffer land area to develop a measureof recreation facility density. Three aesthetics items were measured: amount of litter, amount of graffiti,and overall visual condition of buildings and grounds. Measures wereobtained using CanMaps Streetfiles® and Google Earth StreetviewImaging. As explained in detail elsewhere, criteria used to assess the itemswere based on physical disorder studies and measurements were obtained usinga 360 degree panoramic view and subjective ratings of 15 points within eachbuffer . The measure of litter was based on a scale that ranged from0 = ‘a considerable amount (more than 20pieces)’ to 4 = ‘none (no litter).’Amount of graffiti measured was based on a scale from0 = ‘a considerable amount (more than 5tags)’ to 3 = ‘none (nograffiti).’ The condition of buildings and grounds was scoredfrom 0 = ‘poor (major overhaul needed to improveappearance of buildings)’ to3 = ‘excellent (most buildings in immaculatecondition).’ Since 15 points were investigated within eachbuffer, summary scores ranged from 0–60 for litter and from 0–45for graffiti and the conditions of buildings and grounds. The intra-raterand inter-rater reliability coefficients for repeated Google Earth streetview assessments ranged from 0.78 to 0.99 and from 0.65 to 0.99,respectively, for these items . Google Earth street view assessments are well correlated toscores obtained by in-person assessments, with correlation values rangingfrom 0.65 to 0.99 . A principal component factor analysis based on the three measures was used tocreate a summary aesthetic score. There was agreement between the threevariables, and together they accounted for 54% of the variance(Cronbach’s alpha = 0.63). Factor loadings were 0.81 forlitter, 0.75 for graffiti, and 0.65 for conditions of buildings and grounds.The Anderson-Rubin method was used to calculate a summary aesthetics z-scorewhich was subsequently divided into quartiles. Covariates were chosen based on their demonstrated associations with physicalactivity, their inclusion in prior research on the built environment andphysical activity in young people, and their availability within the HBSCdatabase [6, 7, 41, 42]. Variables considered as potential covariates at the individual-levelconsisted of gender, age, race (Caucasian, other), and family socioeconomicstatus (SES). Family-SES was obtained using a measure of perceived family wealthbased on responses to the question: “How well off do you think yourfamily is?” Participants were categorized into low(“not very well off” or “not at all welloff”), low-medium (“average”), medium-high(“quite well off”) and high (“very welloff”) groups . Neighbourhood level covariates included neighbourhood-SES, population density,and climate. Neighbourhood-level SES and population density were captured fromthe 2006 Canadian Census data in PCensus for Mappoint (Tetrad ComputerApplications Inc., Vancouver, BC) software was used in combination with ArcGISsoftware. To determine neighbourhood-level SES, three census measures wereconsidered within each buffer: average family income, unemployment rate, andeducation (% of adults with less than high school education) . Principal component analysis indicated good agreement between thethree variables (Cronbach’s alpha = 0.76) with factor loadingsof 0.87 (income), 0.75 (unemployment), and 0.84 (education). A summaryneighbourhood-SES score was created using the Anderson-Rubin method and wasdivided into quartiles. Population density was calculated by dividing thepopulation in each census block by the land area. Average temperature (°C)and average annual precipitation (cm) for the two month period prior to surveyadministration were obtained from the closest weather station to eachneighbourhood buffer using the Environment Canada national climate archive . All analyses were performed in SAS version 9.2 (SAS Inc., Cary, NC). Conventionaldescriptive statistics were used to describe the study sample andneighbourhood-level characteristics. Multilevel logistic regression analysis wasused to examine the relationship between the neighbourhood built environmentfeatures and physical inactivity. All categorical variables were entered intothe models such that the referent group was the most optimal category forphysical activity. This allowed us to present all of the associations as riskfactors rather than as a combination of risk and protective factors. Prior tothe model building process, an empty model was run to calculate an intra-classcorrelation (ICC), which indicated the proportion of variance in physicalinactivity explained by neighbourhood-level differences . An ICC value of 9% was found, justifying the use of multi-levelmodeling. For the model building process, we initially ran bivariate multilevel logisticregression models for each built environment feature and each covariate. Thiswas followed by development of a series of multivariate models that were createdwith a systematic approach. First, all individual-level variables were enteredinto the model (multivariate model 1). Backwards elimination determined theindividual-level variables to retain for subsequent models, based on asignificance level of p < 0.05. Next, neighbourhood-levelvariables were added to the reduced individual-level model to createmultivariate model 2. Backwards selection methods were then performed for thearea-level variables based on a significance level of p < 0.05 toderive the multivariate model 3, which was the final model. Variables found tobe significant at p < 0.05 based on the p-trend, the p-value forany individual category, or the average p-value for all categories were retainedin the model building process. All of the multilevel logistic regression models were fit as generalized linearmodels using the SAS GLIMMIX procedure, with a binomial distribution and a logitlink. This accounted for both the clustered and hierarchical nature of the data.To optimize convergence of the multilevel models, a Newton–Raphson withridging technique was applied . Since physical inactivity is not a rare outcome, the odds ratios (OR) obtainedfrom the logistic regression analyses do not approximate relative risks (RR) . The ORs were therefore transformed to RRs using the followingformula: RR = OR /[(1 – P) + (OR × P)] where Prepresents the prevalence of physical inactivity in each exposure group for thebuilt environment variables . PAR% estimates were calculated to determine the proportion of physical inactivityattributable to features of the built environment that were retained in thefinal model. These were based upon the RR values produced in the final model andthe prevalence of the sample in the relevant neighbourhood built environmentexposure groups. The equation is: PAR% = [P(RR –1)/1 + P (RR – 1)]. For variables with more than two exposurecategories with a significantly increased RR, individual PAR% calculations forthe non-referent categories were summed to create an overall PAR% value. Individual characteristics of the 6,626 participants are presented inTable 1. The mean age was 13.4 years with aneven distribution of males and females. The majority of the sample was Caucasian(73%) and 10% were of low SES. Table 2 describes thefeatures of the 272 neighbourhoods. The provincial/territorial representation ofschools was as follows: Alberta (36), British Columbia (37), Manitoba (12),Newfoundland and Labrador (13), Nova Scotia (4), Nunavut and Northwest Territories(9), Ontario (53), Quebec (41), Saskatchewan (53), and Yukon (14). Table 3 summarizes the bivariate and adjusted(multivariate model 1) associations between the individual-level covariates andphysical inactivity. All individual-level covariates were independently associatedwith physical inactivity, and were therefore retained for subsequent models. Theresults suggested that females (RR 1.25, 95% CI 1.16-1.33), non-Caucasians (RR 1.30,95% CI 1.20-1.40), individuals in the lowest SES quartile (RR 1.38, 95% CI1.22-1.54), and the oldest students (RR 1.25, 95% CI 1.09-1.41) were more likely tobe physically inactive. RR (95% CI) = relative risk (95% confidence interval). * RR estimates for each individual-level variable in multivariate model 1are adjusted for the individual-level variables shown in the table. Table 4 displays the associations between eachneighbourhood built environment feature and physical inactivity prior to (bivariate)and after (multivariate model 2) adjusting for individual-level covariates. In theadjusted model, the neighbourhood walkability score, density of cul-de-sacs in theneighbourhood, and proportion of neighbourhood land area devoted to park space wereall associated with physical inactivity (P trend < 0.05). Theseassociations remained significant after further adjustment for relevantneighbourhood level covariates (temperature and precipitation), as presented in thefinal multivariate model in Table 5. The results of thefinal model indicated that, by comparison to youth living in the least walkableneighbourhoods, the risks for physical inactivity were 28-44% higher for youthliving in neighbourhoods in the remaining three walkability quartiles. By comparisonto youth living in neighbourhoods with the highest density of cul-de-sacs, risks forphysical inactivity were 28-32% higher for youth living in neighbourhoods in thelowest two quartiles. Finally, by comparison to youth living in neighbourhoods withthe least amount of park space, risks for physical inactivity were 28-37% higher foryouth living in the neighbourhoods with a moderate to high (group 2 and 3) amount ofpark space. Figure 1 illustrates an example of a leastideal neighbourhood (e.g., highly walkable, low density of cul-de-sacs, moderate tohigh park space) and most ideal neighbourhood (e.g., low walkability, high densityof cul-de-sacs and dead ends, low park space) based on the associations presented inTable 5. A 1 km circular radius buffer around two of the schools included inthis study. Park space is represented by the green areas and thestreet network is shown with the grey lines. 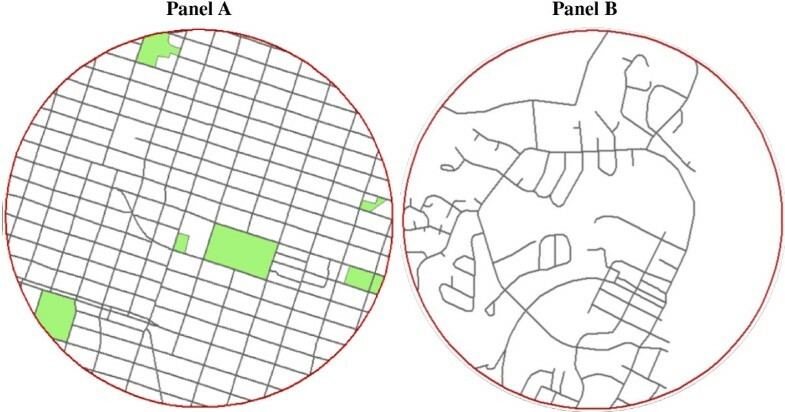 Panel A is an example ofa least ideal neighbourhood (e.g., highly walkable, low density ofcul-de-sacs, moderate park space) and Panel B is an example of a mostideal neighbourhood (e.g., low walkability, high density of cul-de-sacs anddead ends, low park space) for physical activity in youth. * RR estimates for neighbourhood-level variables in multivariate model 2are adjusted for individual-level covariates (gender, age, race, familysocioeconomic status). *RR estimates for each variable are adjusted for all other variableslisted in the table. PAR% estimates for physical inactivity for the neighbourhood built environmentfeatures that were retained in the final multivariate model are displayed inTable 6. PAR% estimates suggested that 23.3% ofphysical inactivity was attributable to living in walkable neighbourhoods, 16.2% wasattributable to living in neighbourhoods with a low density of cul-de-sacs, and15.0% was explained by living in neighbourhoods with a moderate to high amount ofpark space. This national Canadian study examined the associations between several features ofthe neighbourhood built environment and physical inactivity in youth and estimatedthe proportion of physical inactivity within the youth population that isattributable to neighbourhood built environment features. Neighbourhood walkability,density of cul-de-sacs, and park space were independently related to physicalinactivity, although these associations were modest in strength. Nonetheless,because the prevalence of youth residing in non-ideal neighbourhoods was high, ahigh proportion of physical inactivity within the population was attributable tothese three neighbourhood built environment features. A key difference in the current study and previous studies examining the associationsbetween the neighbourhood built environment and physical activity within youth isthat our study considered multiple built environment features and involved ageographically diverse sample from across the country. Previous studies did notsimultaneously examine all relevant built environment features and typically studiedsmall samples from small geographic regions (e.g., a single city). The relationship between walkability and total physical inactivity observed in thisstudy and some other studies of youth [49–51] is opposite to what has been shown in adults [52, 53]. Adults from neighbourhoods with greater walkability have higher totalphysical activity levels than adults from neighbourhoods with a lower walkability , while youth from neighbourhoods with greater walkability have lowertotal physical activity levels than youth from neighbourhoods with a lowerwalkability [49–51]. The opposite patterns observed for adults and youth is likely explainedby the different forms of activity that they tend to engage in. While activetransportation is the most common method in which adults engage in physical activity , it only accounts for a small proportion of youths’ total physicalactivity [55, 56]. A much greater proportion of youths’ total physical activity ismade up of active play and organized sport . As such, the negative relationship between neighbourhood walkability andtotal physical activity in youth reported here and in other studies may reflect thatfeatures of highly walkable neighbourhoods inhibit active play and/or sport. Theremay be greater traffic and safety concerns in highly walkable urban neighbourhoodswhere the streets and houses are tightly packed together (left panel ofFigure 1) which may act as a barrier for youth to gooutside and engage in sport and play as they might do in less busy and populatedareas . Indeed, in our study sample perceptions around heavy traffic and itbeing unsafe in the neighbourhood for young children to play outdoors were slightlymore prominent in the most walkable neighbourhoods (data not shown). Although neighbourhood parks and public green spaces provide a freely accessiblespace for youth to be active, such space was not independently associated withphysical inactivity in the present study. Thus, while park space appears toinfluence the physical activity and body weight of younger children (e.g.,<12 years old) [15, 38], the results from this and other studies [20, 58, 59] suggest that this is not the case in older children and adolescents.Indeed, park users are primarily younger children and older adults [38, 60], and the amenities in most neighbourhood parks (e.g., monkey bars,slides, swings, etc.) are better suited to younger children than to adolescents . Adolescents may travel outside of their home neighbourhood to usecommunity parks with courts and fields, as these amenities are more suitable for thetypes of activities they engage in . Many youth engage in physical activity in public spaces designed for motorizedvehicles such as streets and parking lots . Our findings suggest that the risk of physical inactivity is increasedby 30% for youth residing in a neighbourhood with a low density of cul-de-sacs.Similar associations have been found in the US and Australia [20, 56]. Cul-de-sacs may encourage physical activity by providing an open areafor youth to participate in unorganized sport and play (e.g., street hockey, catch,skateboarding) in close proximity to their home. Consistent with our findings, a recent literature review concluded that thenumber/density of neighbourhood recreational facilities, as measured objectivelyusing GIS, is not associated with physical activity in youth . Aspects such as fees, quality, and accessibility of these facilities maybe more relevant for adolescent use than presence alone . Furthermore, recreational facilities may be more important at thecommunity level than at the neighbourhood level. That is, youth are often drivenoutside of their neighbourhood to participate in organized team and club sportsoccurring at facilities in other areas of their extended community . Previous studies examining the relationship between neighbourhood aesthetics andphysical activity in youth have reported positive [25, 26, 63], negative , and null [65, 66] associations. Thus, as suggested by our findings, there does not appearto be a clear and consistent effect of aesthetics on physical activity within youth.Youth living in aesthetically unpleasant neighbourhoods may become immune to itsaesthetic features, and such features of the environment may not be responsible fordeterring physical activity . The PAR% values for physical inactivity for the three neighbourhood built environmentfeatures independently associated with physical inactivity were 23% for moderate orhigh walkability, 16% for low cul-de-sac density, and 15% for a moderate amount ofpark space. This suggests that the neighbourhood built environment has a meaningfulimpact on youths’ physical inactivity at the population level. This alsosuggests that these three built environment features would be key targets if theonly goal was to improve youths’ physical activity levels. However, asdiscussed above, these built environment features appear to impact physical activitydifferently in adults, youth, and children. Thus, it will be challenging to optimizethe built environment for the entire population. For example, optimizing streetconnectivity and walkability to increase physical activity within adults may have anadverse impact on youths’ total physical activity levels. An alternative thatmay suit all ages would be to design neighbourhoods with poorly connected streetnetworks and lots of cul-de-sacs, but with well-connected walking and cyclingpathways integrated into the design to facilitate active transportation . Future built environment research that simultaneously studies adults,youth, and children is needed. Key strengths of this study are the use of a large sample of Canadian youth, thesimultaneous consideration of multiple built environment features, and thegeneralizability of the study methodology. While the findings may only be relevantfor Canadian youth living in close proximity to their schools, the use ofcontemporary statistical modeling, the population attributable risk, and thesimultaneous investigation of multiple built environment features is novel. There are several limitations of this study. The use of a questionnaire to assessphysical activity may have led to misclassification of this behaviour as youth tendto misreport activity levels [68, 69]. It is likely that this measurement error was non-differential and wouldhave led to underestimated RR and PAR% estimates. Secondly, GIS databases are notalways up-to-date, which would have further contributed to non-differentialmisclassification. Third, this was a cross-sectional study, and therefore we cannotbe certain that the observed relations were causal in nature. However, given thatyouth have limited autonomy in determining where they live, this study was likelynot susceptible to reverse causality. Fourth, we did not assess the presence ofbackyards and driveways at the home, and therefore we may not have fully capturedall aspects of the neighbourhood built environment that may influence youths’physical activity. Fifth, participants were assigned to school neighbourhoods basedon the place where they reported that they lived most often; we were not able toaccount for the fact that some youth may split their time in different homes.Finally, the 2010 Canadian HBSC survey was primarily completed in the colder monthsof the year when physical activity levels are at their lowest , and this may have impacted the associations that were observed. The neighbourhood built environment features most strongly associated with physicalinactivity in this national study of Canadian youth were high walkability, a lowdensity of cul-de-sacs, and a moderate amount of park space. Some of theseassociations were in the opposite direction to what has previously been reported inadults and younger children. While the relative risk for physical inactivityassociated with exposure to any given built environment feature was low, theprevalence of youth exposed to non-ideal environments was high. Thus, at thepopulation-level, a large proportion of inactivity was explained by theneighbourhood built environment. The methods and approaches used in this paper have relevance for and could bereplicated in other countries. To our knowledge, no previous studies haveinvestigated the cumulative and collective effect of several features of the builtenvironment on youth physical inactivity. Determination of PAR% is also novel andmakes a unique contribution to the built environment literature. Since features ofthe built environment may impact youth physical inactivity differently in differentparts of the world, understanding the importance of each individual feature whilecontrolling for the potential confounding from other features of the builtenvironment is important for informing land use planning and zoning policies toimprove physical activity opportunities for youth. We would like to acknowledge Andrei Rosu, Dr. Valerie Carson, Kathleen Gropp,Gregory Pickett, and Dr. Laura Seliske for their assistance with the GIS datacollection. This study was funded by an operating grant from the CanadianInstitutes of Health Research (MOP 97962), and a second operating grantco-funded by the Canadian Institutes of Health Research and the Heart and StrokeFoundation of Canada (PCR 101415). In addition, Ian Janssen was supported by aCanada Research Chair award. The Health Behaviour in School-aged Children Survey(HBSC), a World Health Organization / European Region collaborative study, wasfunded in Canada by the Public Health Agency of Canada and Health Canada(Contract: 4500267124). William Pickett and John Freeman are the principalinvestigators of the 2010 Canadian HBSC and Matthew King was the nationalcoordinator. The HBSC is coordinated internationally by Candace Currie(University of St. Andrews). Authors’ contributions to this paper are as follows: IJ and RL designedresearch and contributed to the conception of the study. RL assisted in GIS datacollection, performed data analysis, and drafted the initial version of themanuscript. IJ was a co-investigator of the Canadian HBSC study, provided advice andinput on the analyses, and critically reviewed and edited the manuscript forintellectual content. Both authors have responsibility for the final content andapprove the final manuscript.